Woodley stars as Tami, a young woman with wanderlust, odd-jobbing her way around the world until she meets Richard (Sam Claflin), a handsome British sailor, and the two fall in love amidst a tropical idyll. Within months, they are agreeing to sail a yacht across the Pacific to California, but their testing-yet-romantic sojourn is wrecked, literally, by a hurricane. Their yacht crippled, and Richard too badly injured to be useful, Tami must sail 1,500 miles to Hawaii with nothing but a sextant and a watch to guide her (it’s the early 1980s, pre-GPS and satellite communications). This is the work of Icelandic filmmaker Baltasar Kormakur, who has made Marky Mark vehicles like Contraband and 2 Guns, but also nerve-shattering survival flicks like The Deep and Everest. 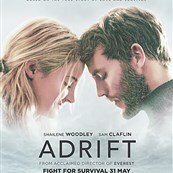 Adrift is as good a match for him as it is Shailene Woodley, and by now his signature is recognizable: Nature is not anthropomorphized, but neither is it markedly cruel. Nature just IS. The hurricane is not out to get Richard and Tami, it’s just a thing that is happening and they have to deal with it. Unfortunately, it’s a huge storm and they’re in a forty-foot pleasure craft. Adrift cuts between Tami steering the shattered boat toward Hawaii and Tami and Richard’s unfolding relationship, which allows Kormakur and cinematographer Robert Richardson (Quentin Tarantino’s and Martin Scorsese’s go-to guy) to juxtapose warm, sun-drenched island locales with the cold fastness of the open ocean. Kormakur’s open water is not beautiful, it is impenetrable and black. The marked difference between the more navigable waters of the island and the open ocean is the warning sailors should heed. A few years ago Robert Redford starred in a sea-survival film, All Is Lost, which is about the most un-Hollywood exercise in filmmaking in recent memory. It’s a great film, but it is not particularly interested in the audience experience. It was released the same year as Gravity, which is also a survival movie but is decidedly more popcorn. Adrift lands somewhere between the two, neither working as hard as Gravity to ensure the audience’s pleasure, nor as determinedly singular as All Is Lost. It is, for the most part, an enjoyable movie that could shape up to be a nice little summer sleeper. There is a particular choice made in the narrative that might put some people off, but it works to keep the pace up and prevent the audience from becoming bored. (All Is Lost does not care if you’re bored.) 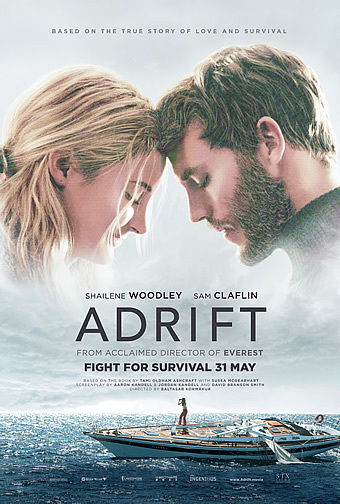 Adrift is a director and an actor playing to their strengths, and the result is a solid survival tale that avoids the histrionics and sap that often plague the genre.